Easy on the eye and with a high level of anti-corrosion capabilities up its sleeve, our 11mm 1×19 stainless steel wire rope delivers a double helping of good looks and practicality. And with a load limit of a little over 10 tonnes, it has impressive strength as well. Salt water and other substances can quickly take the sheen off lesser metals over prolonged periods of exposure, but with stainless steel rope you will see none of the usual ill effects of corrosion building up quickly. The 11mm diameter of this particular 1×19 construction rope makes it a little tougher and sturdier than its more slender stable mates. So for use in harsh maritime environments, or for adding a bit of glitz and glamour to an architectural project, it is a great option. 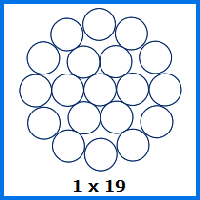 Thanks to the wide range of fittings we supply, your order of 1×19 construction 11mm stainless steel wire rope can be put together in whatever bespoke configuration you need. Just ask us about the options that are available, including swaged terminals, and you will see how much variety is available. No matter the extent of your ambitions and creativity, our high quality AISI-standard stainless steel rope will be a good match. Whether you think this is the right wire rope for you, or you need a bit more help before making a decision, contact Rope Services Direct today. We can be reached on 01384 78004 or via our website. 11mm 1x19 Stainless Steel Wire Rope Overall rating: 5 out of 5 based on 6 reviews.